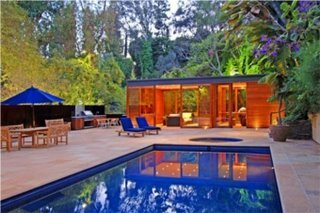 Private, secure, walled and gated compound in prime lower Bel Air. 4 Bedroom 4.5 bath plus spectacular pool house. One bedroom guest house over garage. Finest materials & workmanship throughout. Huge climate controlled storageroom would make perfect gym. Screening room with floor to ceiling windows, library, wet bar, new bath. Lush landscaped with specimen plants & Koi pond.